This recipe is more on lines of a snack and a good option during and after training. The variations are limitless as my clients and there friends put an assortment of ingredients in to them to make them there own. The 2 main ingredients are dates and nuts after that you can anything you want. The other main thing your going to need is a food processor preferably a 14 cup size, depending on how many your going to make. Madjool Dates (pitted) from Trader Joes.Half of the container for a batch and then the rest for another batch. 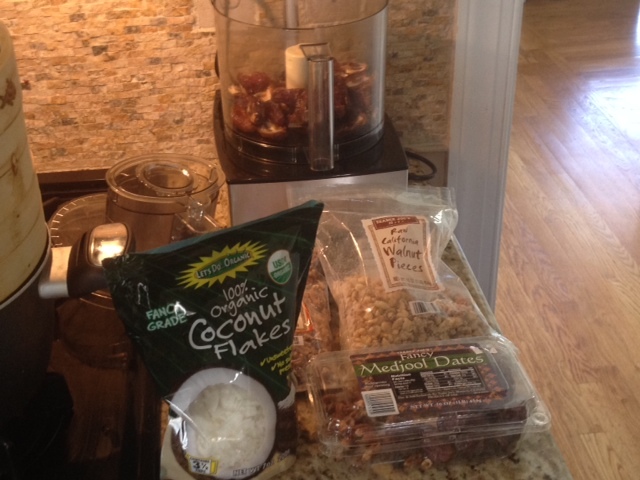 1 cup almonds, 1 cup walnuts, 1/2 cup Unsweetened coconut flakes, 1/8 teaspoon of cinnamon. Put them in and don’t go over the fill line! Pulverize into a dough like consistency. Make them into any shape you want. Turn on the food processor and let it run til it forms a ball (similar to cookie dough) It may take 3-4 minutes but be patient for it to come together. Then form into balls and store in airtight container. Remember these are calorie dense! Great choice for post workout snack!